So, it’s been about a month since I first released the Ultimate N5 Deck out into the wild. A few people have started putting it to use and I’ve heard back from a few of you on some improvements that can be made to the deck. The new improvements will hopefully make the words a lot easier for you to practice and remember. I’ve reduced the amount of cards and also added a few more features so that it’ll be less confusing when you go to study. Looking through the deck, I realized that some of the senses/definitions for the cards could be combined to form one ‘super’ sense. The idea behind this is for simplicity. It is a lot more simple to remember one sense of a word that you can expand to fit other meanings than to learn several senses that have a similar meaning. That sounds a little confusing so let me explain. Before, the noun 青 had two cards, one for blue and one for green. These are technically two separate senses for the same word. However, you can expand the meaning of blue to include green. Thus, I combined blue and green into one card. Now, as for the other few words that can’t reasonably have all their senses smashed into one I still kept separate cards. This is so you can learn them separately in their different sense. There are two added features to these cards. First, you’ll see a number in parentheses before the kanji. This is because Anki requires you to not have any duplicate questions or answers. You’ll just have to ignore it. The other thing about the cards is that the separate cards point back to the other senses for that same kanji. 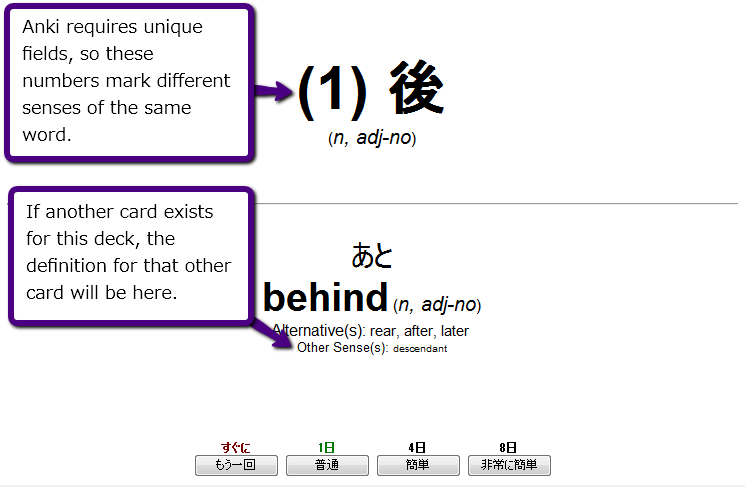 For example, for 本, it might have the meaning as ‘book’, but also list ‘main’ and ‘counter for long cylindrical objects’ in the other senses section of the card. The reason for this is I didn’t want you to guess one meaning and the meaning for the card be something else (because one kanji is on several cards). So, in this way, if you get the 本 – book card, and you guessed ‘main’ instead you’ll see that in the other senses section. Does that all make sense? Let me know if it doesn’t. I’ve tried to put a lot of thought into this deck in order to make it easy to use and easy to remember. It might be pretty easy to get lost in this deck with all the extra do-dads I threw into it, but don’t despair. It is a lot easier than you think and should help you score higher on the test because you’ll be armed with extra knowledge that doesn’t come with some other decks. 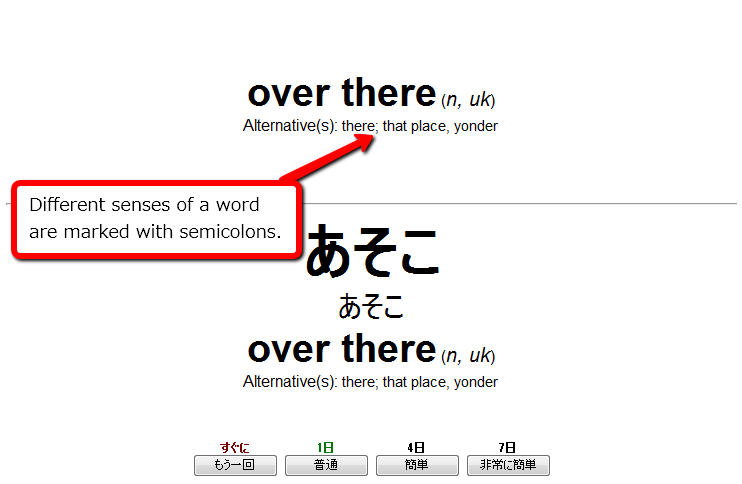 The key here is to remember the primary English definition of the word, then use that as the key to the other words in the ‘alternatives:’ section. Don’t try to remember all the words for the kanji in one go. It is way too much information and the main reason why I tried to simplify this deck (and the deck at memrise.com). Furthermore, the parts of speech are there solely to distinguish what kind of word it is and how it is used. For 90% of the words in the deck the part of speech should be straightforward, but a few of them might throw you for a loop so I added them in. I try to remember these parts of speech by coming up with a short and simple example sentence. Doesn’t have to be too complicated, just something to help you remember the part of speech. Again, I’m making this data available under the Creative Commons Attribution-NonCommercial 3.0 License. This means that you can share or modify this collection of data, but you can not resell it, and you must attribute your work (with a link to https://jlptbootcamp.com). I’d also like to hear about what you’ve done to the deck, or any changes that you think would make it more useful. If you have any suggestions, don’t hesitate to contact me. P.S. Did you like this ultimate deck? Sign up for the newsletter then! Question – which program can one open and read the Ultimate N5 Deck for Anki? Is it Word? Adobe? Anki deck needs to be opened in the anki software. You can pick that up at HTTP:\\ankisrs.net for free. If you are not familiar With anki it is really popular spaced repetition system that I lot of people use. Hi Mac. Thanks for creating this deck and thanks for all your tips and advice. I recently found your blog and it has been a source of encouragement and motivation as I prepare for N3. Keep up the great work! No problems Paul, great to hear from happy readers! Is this deck sorted in any particular order? Ie, should new cards be studied in the order added, or in random order? The cards aren’t in any particular order. I guess it would be useful to organize them by most often used, but I don’t really have that data available at the moment. This is kind of a case of damned if I do, damned if I don’t. I lot of people prefer having all the kanji in the deck (myself included) because you can actually use the words once you have learned them. The earlier you get exposed to them the better, and then you don’t have to essentially relearn them later when you learn the kanji that is associated with them. Now, there is a good sized group of people that just want to study the deck with only N5 kanji. I understand that. I’ve been working on refreshing this deck for awhile, it just seems that I keep getting snowed in every time I get enough free time to do, so I apologize for the delay. It is on my list of things to do, but right now I’m in the middle of a massive translation project. I should have more time later to edit it and patch it up. There are ton of tweaks that users have requested that I would love to put in (as well as add the invaluable audio to the deck). Are you taking the test in Dec?